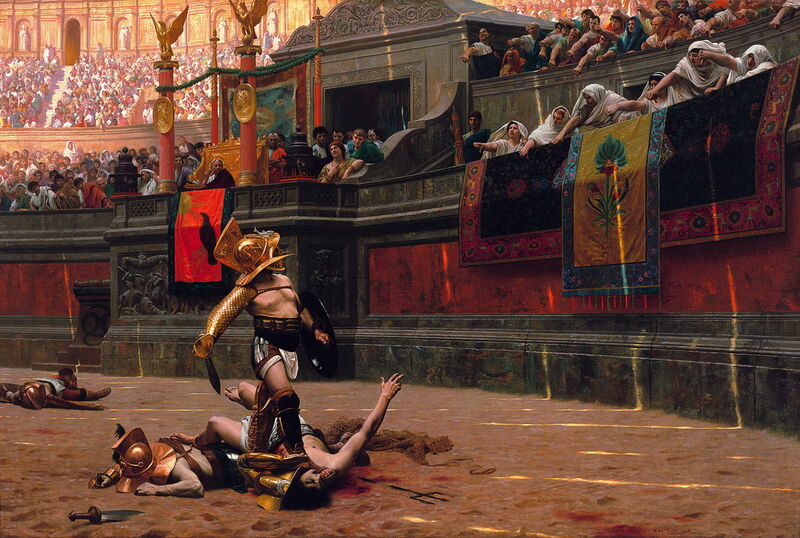 Jean-Léon Gérôme (1824–1904), Pollice Verso (detail) (1872), oil on canvas, 96.5 x 149.2 cm, Phoenix Art Museum, Phoenix, AZ. Wikimedia Commons. I have already mentioned Poussin’s ‘péripéties’, which he used to condense the causes of an event, its consequences and moral implications, into his narrative paintings. You may have been as blurry in your mind as to what these ‘péripéties’ are, as I was. This article should, I hope, give you a much clearer idea as to their importance in narrative, particularly that in paintings. The original word, peripeteia, is the Greek περιπέτεια, translated into French as péripétie, and sometimes anglicised as peripety (good for crosswords and Scrabble). It means a sudden change of fortune or reverse of circumstances, as appears in the narrative of many classic tragedies. Aristotle, in his Poetics, still an excellent source on narrative, considered that peripeteia is most effective in drama, particularly tragedies, and when accompanied by discovery (anagnorisis), in which a character in the narrative learns something of which they were previously ignorant. There are many classical examples, of which I will mention but two. In Sophocles’ play Oedipus Rex, the hero Oedipus only learns about his parentage towards the end of the play, when it is told to him by the Messenger. The latter intends to comfort Oedipus by assuring him that he was the son of Polybus, who raised him, but instead Oedipus realises that he had murdered his biological father Laius, and married his mother, Jocasta. This transforms him from being the mighty and arrogant king of Thebes to being a broken man. The second example is of the conversion to Christianity of Paul when he was on the road to Damascus, and is again accompanied by (religious) discovery. Because conventional narrative paintings depict a moment in time, the difficulty which they face in terms of narrative is providing sufficient cues to previous and subsequent events. More often than not, they leave it to the viewer to associate the well-known text narrative to which the painting refers. But in narratives which feature peripeteia, by depicting the moment of changing fortune, the artist is able to link in both the before and the after. One of my best examples is inevitably Poussin’s Rinaldo and Armida (c 1630), which shows the exact moment that Armida’s intention changes from murder, with her drawn dagger still held in her right hand, to romance, with her left hand caressing Rinaldo. do not hit that same sweet spot. Nevertheless, Tasso’s Jerusalem Delivered is a rich source of peripeteia, and it has been suggested that Poussin’s understanding of its role in narrative comes from Tasso’s writing. Jean-Honoré Fragonard’s Rinaldo and Armida (c 1760-65). Perhaps those three, plus Poussin, were the only artists who were sufficiently conversant with Aristotle’s writings. The notably gory examples which I gave of Judith in the act of cutting off Holofernes’ head are also vivid moments of peripeteia for both the participants. Not all narratives, of course, make for good depictions of peripeteia. The executions by firing squad tackled by Goya, Manet, and Gérôme have their moment of peripeteia long before then, yet directly depicting the real reversal of fortune in those instances would have resulted in weak and obscure images. But when peripeteia is paintable, it usually results in the most effective narrative. Looking back at the narrative paintings which I have discussed so far in this series, the following strike me as particularly powerful examples. 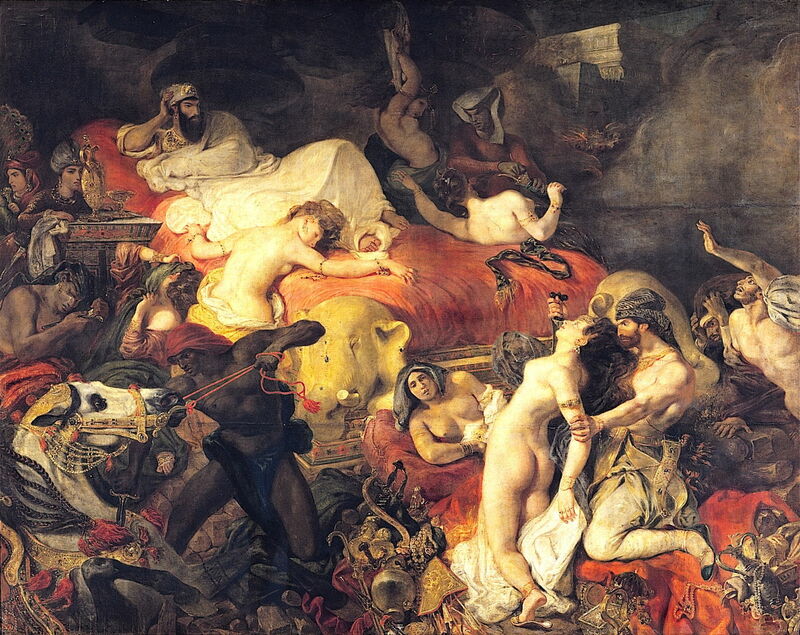 Delacroix’s The Death of Sardanapalus (1827) shows the moment of the fall of the last great Assyrian king, a clear reversal of fortune in which his past opulence and imminent destruction are both painted eloquently. 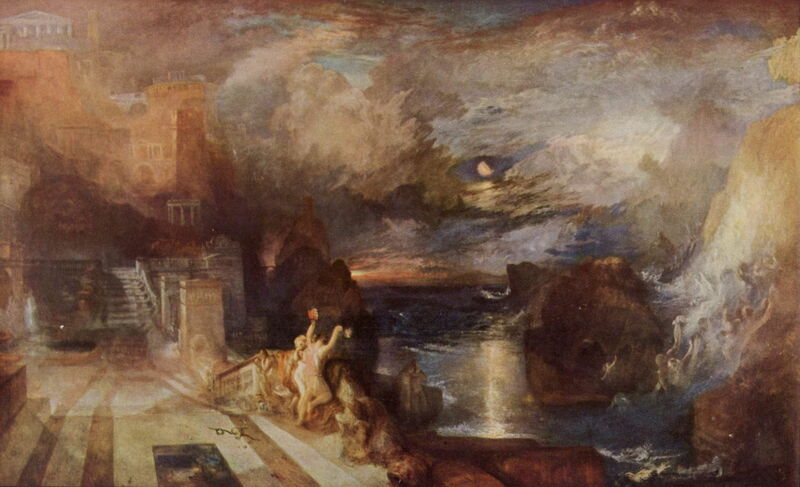 Turner’s The Parting of Hero and Leander (1837) shows Leander just about to drown, ending his earthly relationship with Hero in their joint deaths. Gérôme’s paintings are here quite exceptional, in that most of his best narrative works are set at exactly the moment of peripeteia. 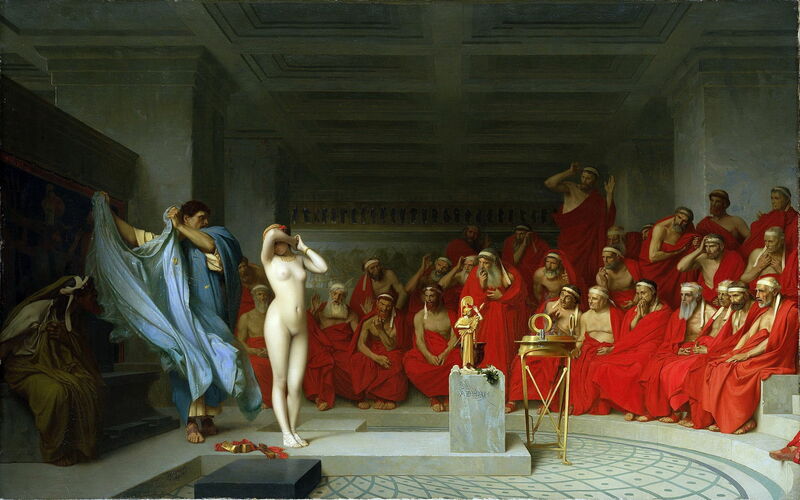 In Phryné before the Areopagus (1861), he shows the instant of peripeteia, denouement, and revelation. 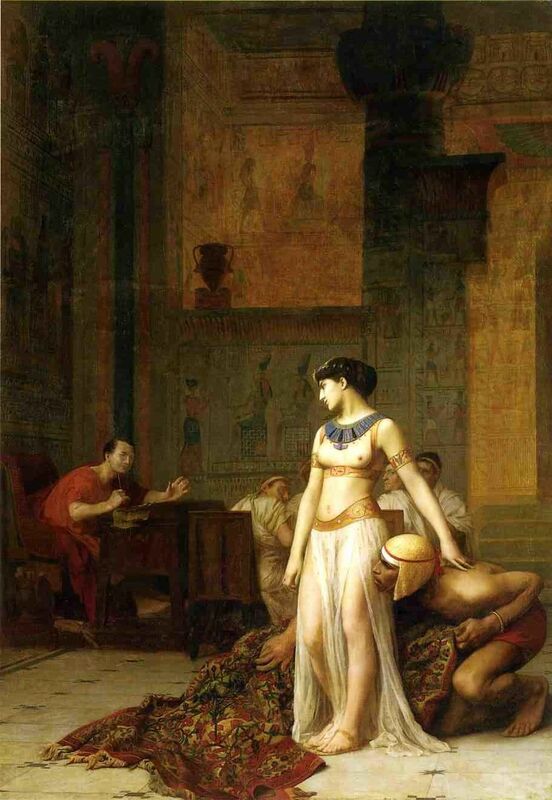 Cleopatra before Caesar (1866) shows the moment that the queen of Egypt stands up from her cover, the roll of carpet, and looks forward to their forthcoming relationship. Gérôme’s Pollice Verso (1872) not only captures the moment of peripeteia, but shows us how it can be iconified in a simple gesture. 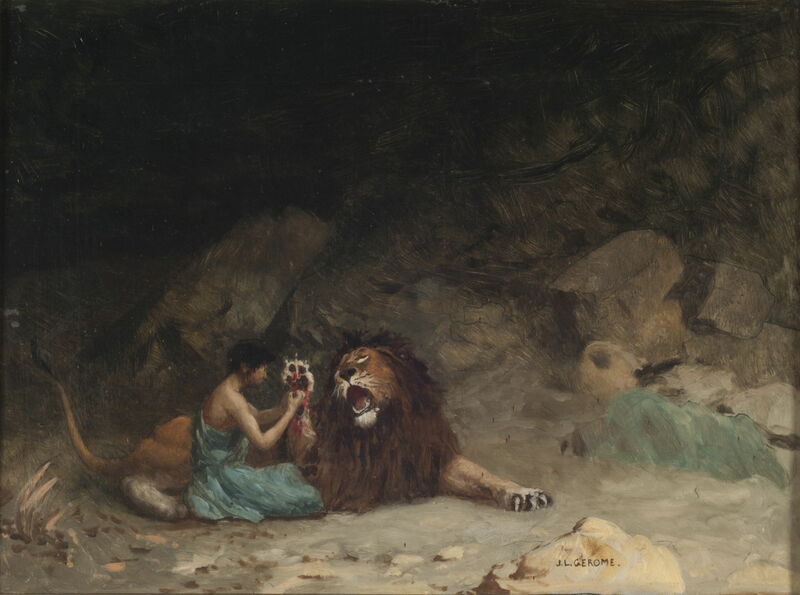 His Androcles (c 1902) shows the hero extracting the thorn from the lion’s paw, the first of Androcles’ two peripeteia. Although I have drawn attention to the difficulties faced by narrative painting in the 1800s, it is interesting that other artists of that century were also aware of the importance of peripeteia. 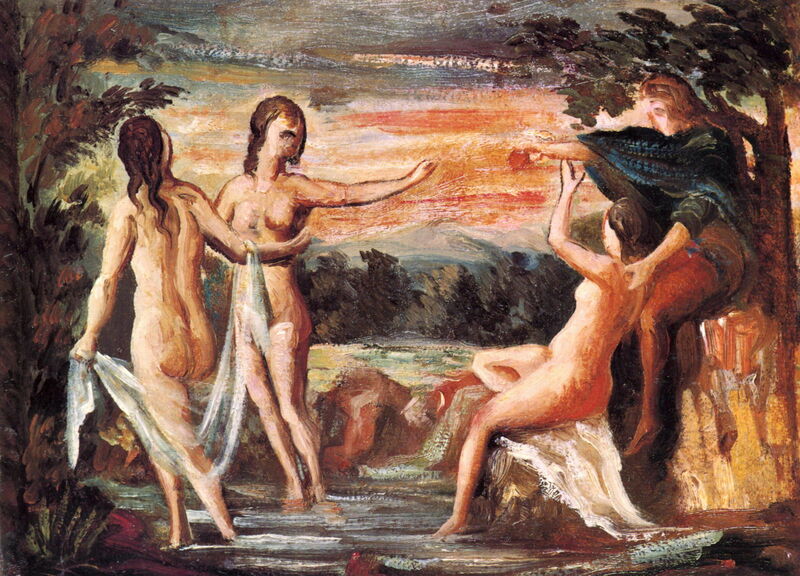 Cézanne’s The Judgment of Paris (1862-4) shows us the moment that Paris presents the golden apple to the victor, sealing the fate of the Trojans, and the history of the Mediterranean in early classical times. 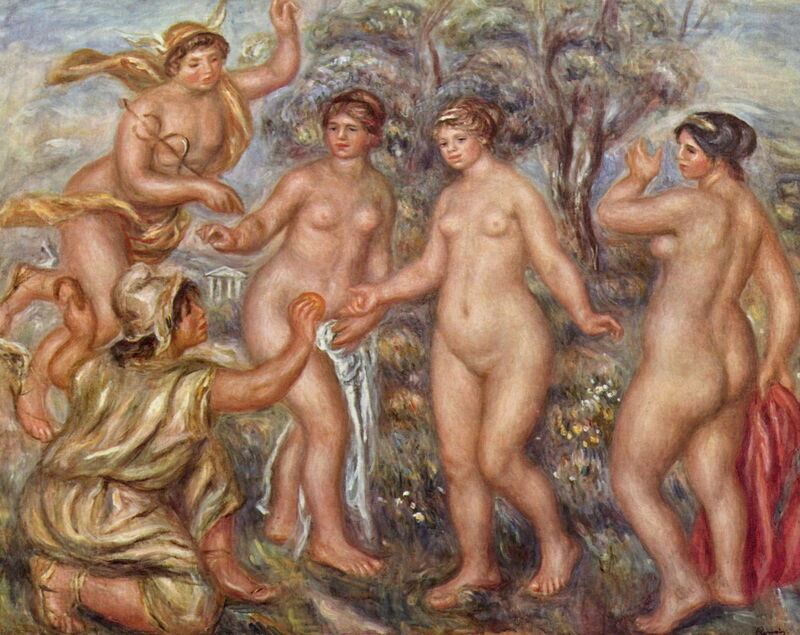 For all my suspicions that Renoir’s version, The Judgment of Paris (c 1908-10), was just an excuse to paint three voluptuous nudes, he too chooses the moment of peripeteia. 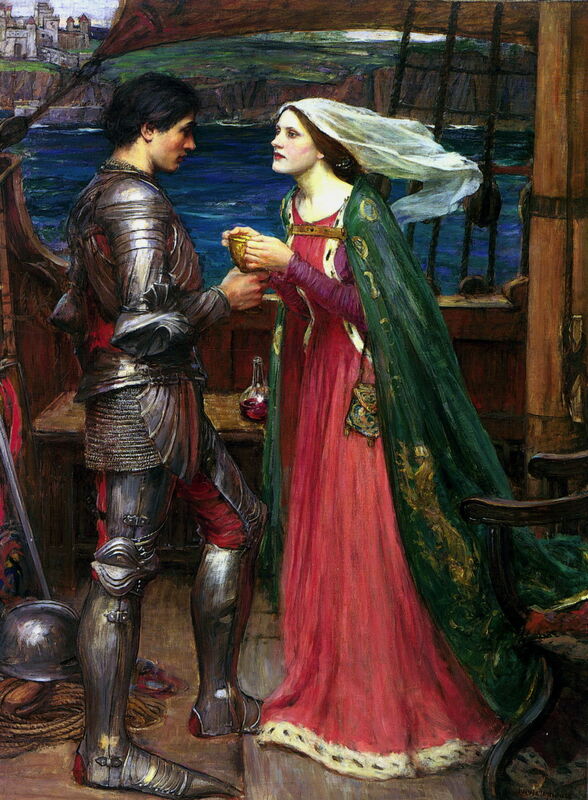 Another exemplary painting in this respect is Waterhouse’s Tristan and Isolde (1916), which shows the couple falling in love as they drink from the potion, and setting up their future tragic relationship. Finally, Paula Rego picks the moment of peripeteia in the story of Snow White, in her Snow White Swallows the Poisoned Apple (1995), even if she re-interprets its associations and meaning. Such is peripeteia: not by any means the only way to tell an effective story in a painting, but a well-established and very powerful one. Posted in General, Language, Painting and tagged anagnorisis, Aristotle, discovery, Gérôme, narrative, painting, péripétie, peripeteia, peripety, Poetics, Poussin. Bookmark the permalink. How can you tell whether it is a hard drive or an SSD?